If you are looking for a European tourist destination, consider the island of Sicily, an island in southern Italy. Depending on your specific interests, this beautiful area can be an ideal vacation spot. It offers classic Italian food and fine local wine. And many parts of Sicily haven’t yet been discovered by tourists. 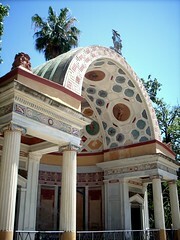 This article presents Sicily’s historic capital, Palermo. A companion article presents western Sicily. Another companion article presents eastern Sicily. Palermo is Sicily’s capital and largest city with a population of about 700,000. It was founded in the Eighth Century B. C. by the Phoenicians who wanted to take advantage of its natural harbor. This strategically city was conquered time and time again. For example, it was once a Muslim city with two or three hundred Mosques. The period of the Norman occupation starting in 1072 and lasting for well over one hundred years was considered Palermo’s golden age. The conquests continued almost unabated. Palermo was heavily destroyed during the Second World War. To some extent Palermo is still in the hands of a conqueror, the Mafia. We’ll start our tour with the Cathedral, built in 1185 on the site of a Byzantine basilica transformed into a mosque by the Saracens in the Ninth Century. Construction continued for centuries, with each addition or renovation done in the style of the times. This building contains a solar observatory, built in 1690, which served to coordinate Palermo time with St. Peters in Rome, and to ascertain the correct day to celebrate Easter. As elsewhere in Sicily, lava was an occasional construction material. Among the dozen or more historic churches worth visiting are San Giovanni dei Lebbrosi (St. John of Lebbrosi) dating from 1072, San Giovanni degli Eremiti (St. John the Hermit) whose style includes multiple Arabic influences, the Greek Orthodox church La Martorana also known as Santa Maria dell’Ammiraglio (Saint Mary of the Admiral), and San Cataldo (St. Cataldo), with its red Saracen domes. The latter two churches overlook the Piazza Bellini behind City Hall. The nuns of Martorana were famous for their fruit and vegetable shaped marzipan that they used to decorate barren fruit trees. While the convent no longer exists, this candy is still being made. But you won’t find it in trees. Talking about trees, many churches and other buildings are situated in or near beautiful parks. Santa Maria dello Spasimo was built just over 500 years ago. It was honored by Raphael’s painting Sicilia’s Spasimo hanging in the Prado in Madrid, Spain. This church subsequently became a hospital and even a warehouse. It is now an open-air theater and cultural center. Talking about theaters, the Teatro Massimo (Great Theater) is Italy’s largest (and Europe’s third largest opera house) even if its seating for 1350 spectators is less than half of the original plan. The original Teatro took twenty two years to build; it was closed in 1974 for safety and remained closed for twenty three years, reopening a mere four days before its centenary. The movie Godfather Part III included a famous violent scene that took place on the Teatro’s steps. The Palazzo Reale (Royal Palace) also known as Palazzo dei Normanni (Norman Palace) was the seat of government for centuries. It is now the home of the Sicilian Parliament. The Cappella Palatina (Palatine Chapel) was the royal chapel of the Norman kings of Sicily. Its mosaics are well worth seeing. The building and its furnishings are a great combination of Arabic, Byzantine, and Norman styles. If you are lucky you’ll be able to see the Sala di Re Ruggero (King Roger’s Hall), the royal apartments to get an idea of how the other half lived. Make sure to see the Museo Archeologico Regionale Salinas (Salinas Regional Museum of Archeology) with its prehistoric cave drawings and a expertly reconstructed portion of a Greek temple in Sicily dating back two and half millennia. Then for a change of pace visit the Museo delle Marionette (Marionette Museum) with its focus on Sicily in the days of the Normans. Many marionettes are hundreds of years old. There are live marionette performances at the Theatre Cuticchio. You might want to finish your tour of this very special city at the Piazza Pretoria (Pretoria Square). The fountain that dominates this square contains hundreds of sculptures whose lack of clothing led to the name, “Fountain of Shame”. We suggest that you see this square at night. What about food? Sicily has always adapted foreign foods to come up with Sicilian versions. The Greeks brought vegetables, fish, and grape vines; the Normans brought cod and baking. The Arabs introduced nut and fruit trees, lamb and goat, cheese and pasta including couscous. Put these influences all together and you have Sicilian cuisine, unique Sicilian cuisine. Let’s suggest a sample menu, one of many. Start with Pasta con le Sarde (Pasta with Sardines and Bread Crumbs). Then try Insalata de Mare (Steamed Fish). For dessert indulge yourself with Cannoli (Deep fried Pastry stuffed with Ricotta Cheese and Candied Fruit). Be sure to increase your dining pleasure by including local wines with your meal. We’ll conclude with a quick look at Sicilian wine. Even though Sicilians drink less wine than the residents of any other part of Italy, Sicily holds first place among the 20 Italian regions for both acreage devoted to wine grapes and for total annual wine production. If Sicily were an independent country, it would be the world’s seventh largest wine producer. The following statistic may surprise some people: Only a bit more than half of Sicilian wine is red. Sicily produces nineteen DOC wines. DOC stands for Denominazione di Origine Controllata, which may be translated as Denomination of Controlled Origin, presumably a high-quality wine. Only about 2% of Sicilian wine carries this sometimes prestigious classification. Sicily’s best-known wine is Marsala DOC, first exported to England well over two hundred years ago. Most Marsalas are sweet; some are great, others are not. Over the years Levi Reiss has authored or co-authored ten computer and Internet books, and yet he prefers fine Italian, German, or other wine, accompanied by the right foods and good company. He knows what dieting is, and is glad that for the time being he can eat and drink what he wants, in moderation. He loves teaching a variety of computer classes at an Ontario French-language community college. Visit his new wine, diet, health, and nutrition website www.wineinyourdiet.com and his Italian food website www.fooditalyfood.com. Palermo in Sensational Sicily www.SensationalSicily.com is presented by Alessandro Sorbello http Sicily is rich in history and culture. This project is born from a collaboration between the Region of Sicily www.regione.sicilia.it. The Italian Chamber of Commerce, New Realm Media www.newrea.